PipeAndDrapeOnline.com's Learning Center. Our blog features helpful tips on pipe and drape, backdrop kits, event decor trends, trade shows, and much more. Discover how you can create incredible events! Your church stage is used all year, from regular Sunday services to weddings, baptisms, and holiday events. 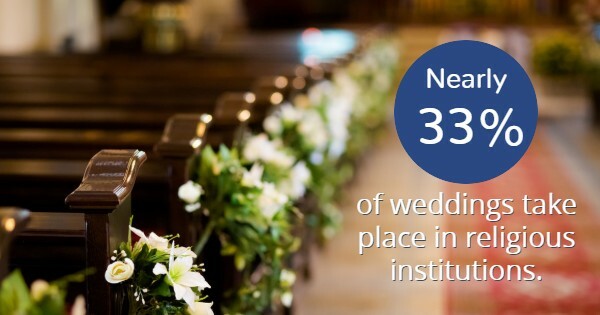 In fact, nearly 33% of weddings take place in religious institutions. That being said, you want to make sure your church stage is always looking its best. Here are some ways you can decorate your stage so it stands out all year round. Church stage backdrops: One of the best ways for you to spruce up your church stage is by using pipe and drape. You can create gorgeous church backdrops for any event of the year. Whether you're hosting a wedding or celebrating Easter, photos taken at your church will all feature your beautiful backdrop drapes. You can get different fabrics and colors to change them throughout the year for different types of events. Lighting: Another feature that can make your church stage stand out is lighting. With the special effects of modern lighting technology, you can make your stage look different almost every day. You can change the color of your bulbs, the angle of the strobes, or the brightness of the LEDs to highlight certain features on your stage to really make it pop. Foliage: Almost everyone loves foliage, and you can change it seasonally. You can put out carnations for Christmas, roses for Valentine’s Day, and sunflowers all summer long. You can invest in faux flowers and bushes to put around your church stage so you can reuse the pieces over and over again. Props: If you plan to celebrate any fun holidays or host VBS (vacation bible school), then you definitely need some props. VBS programs typically use props like fun animal cut outs or items that make you feel like you're on a beach. You can also use props to help strengthen a sermon message that might last for a few weeks. Band equipment: Finally, you'll want your musicians' instruments to be up on your stage. The drums, piano, guitars, and anything else you might need should be readily available for your worship team to play for your congregation. Just make sure you leave enough room for the worship leader to deliver the message from the church stage. Your church's stage is at the center of attention very often, and you want it to look its best. Try adding these features to really draw the attention of your congregation to the stage. Why Would Anyone Buy Sheer Drapes?